Today’s post is a handmade Valentine’s card that I made with the new Silver Vellum designer paper from the Occasions catalog. This card would also be great for a wedding or anniversary as well! So the details: The card base is Whisper White with a layer of Silver Foil paper. 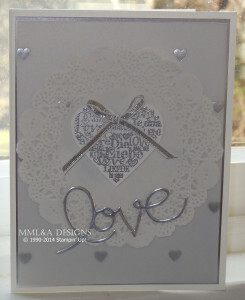 The vellum with the embossed hearts is cut just a tad smaller than the silver foil. The Heart from the Language of Love stamp set in the Occasions catalog is stamped and embossed with Silver embossing powder. The heart is cut out using the Heart shaped framelits. The heart is layered onto a doily with a piece of silver ribbon attached. I used a scrap of the silver foil paper to cut out Love with the Expressions framelits from the Holiday catalog. Like this card? This card is one of the cards from my Valentine’s class. Happy Stampin’! Tuesday Specials from Stampin’ Up!